Aviv Amirav, Professor of Chemistry at Tel Aviv University and Director - Aviv Analytical. Dan Muller, Ph.D., Arson Investigation Unit, Division of Identification and Forensic Science, Israel Police. Arson is the crime of intentionally and maliciously setting fire with the intent to cause damage. In the USA alone over 25,000 cases of arson are reported per year with estimated civilian death rate of about 300/year and property damage approaching one $Billion per year. Many arsonists use fire accelerants, such as gasoline or diesel fuel to get the fire going. However, arson analysis of the source of Gasoline, Kerosene, Diesel fuel and other accelerants represents a challenging task. We developed a new method of Isomer Distribution Analysis (IDA) and its applications for improved fuel source characterization and fingerprinting, based on the use of GC-MS with Cold EI. For more details please read A. B. Fialkov and A. Amirav "Hydrocarbons and Fuel Analysis with the Supersonic GC-MS - The Novel Concept of Isomer Abundance Analysis". J. Chromatogr. A. 1195, 127-135 (2008). In this Blog note we report on the use of the Aviv Analytical 5975-SMB GC-MS with Cold EI system for improved arson analysis via isomer distribution analysis of arson samples. Isomer distribution analysis is based on the fact that fuels and hydrocarbon mixtures are composed from majority of hydrocarbons and each of these hydrocarbons have many isomers that elute before the linear chain alkane, and the greater the degree of branching the earlier is the isomer elution time. Isomer distributions depend on the geographic origin of the oil that served to produce the fuel (accelerant), fuel vendor and method of fuel refining and its catalysts. Thus, isomer distribution analysis provides, as shown in this post, mass chromatograms that serves as a fuel/accelerant fingerprints to correlate them with their sources and arsonists. Five fuel samples were brought to our lab by the arson team of the Israel central police laboratory. The samples included Gasoline 2, Gasoline 3, Gasoline 4 which is Gasoline 2 after its 50% vaporization, Kerosene which was highly vaporized to be heavier than standard diesel fuel and a local diesel fuel that was contaminated with motor oil. Samples were analyzed as received with injection of 0.2 or 0.5 µL with split ratio 100 (2-5 µg total fuel on column) and analyzed with 70 eV Cold EI (EI of cold molecules in Supersonic Molecular Beams). Keep reading how the 5975-SMB GC-MS with Cold EI helps in arson analysis via its unique capability of isomer distribution analysis. The Aviv Analytical 5975-SMB GC-MS with Cold EI is based on the use of supersonic molecular beams for interfacing the GC and the MS and a contact-free fly-through ion source that provides enhanced molecular ions as described in a previous post "By how much is the Molecular Ion Enhanced in Cold EI". Critical to isomer distribution analysis is that even highly branched hydrocarbon isomers exhibit abundant molecular ions in Cold EI as discussed and described in another post "Hydrocarbon Isomers - Why Aren't They Analyzed", thus, for isomer distribution analysis we analyzed the arson samples in full scan more (and/or in combined full scan and SIM modes) and perform reconstructed single ion monitoring (RSIM) mass chromatograms on selected hydrocarbons molecular ions that serve as a fingerprint for the sample to help correlate it with its source and arsonist. Injector: 250ºC injector temperature with split 100. He column flow rate: 2.4 ml/min for the gasoline analysis and 5 ml/min for the Kerosene and Diesel fuels. GC Oven: 40ºC followed by 20ºC/min to 250°C for gasoline's and 50°C followed by 20°C/min to 300°C for the Kerosene and Diesel fuels. SMB source: 8mA emission current, 62 ml/min He makeup flow. In Figure 1 below we show gasoline analysis of samples 2, 3 and 4 as indicated in the three total ion mass chromatograms (TIC). The TIC of gasoline 2 and 3 look very similar although they were purchased and collected from different sources. The TIC envelope of gasoline 4 looks different since this gasoline is actually gasoline 2 that was partially vaporized and in that way lost ~50% of its volume. 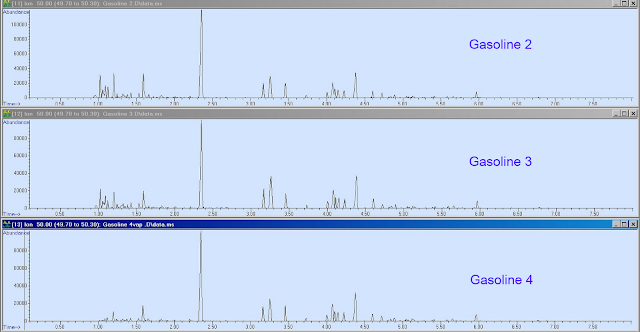 These three TIC mass chromatograms look similar to all the gasolines and can be obtained by any GC-MS. However, these TIC alone contain only limited forensic information that these samples are of gasoline. Figure 1. 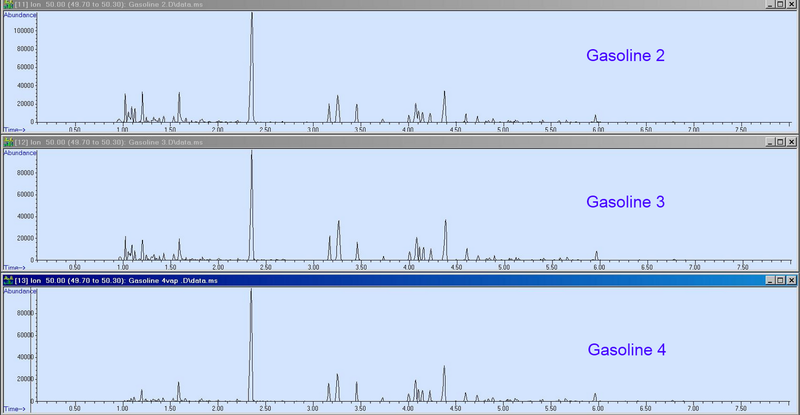 Total ion chromatograms of Gasoline 2, Gasoline 3 and Gasoline 4 which is 50% vaporized Gasoline 2. Click on the Image to zoom. 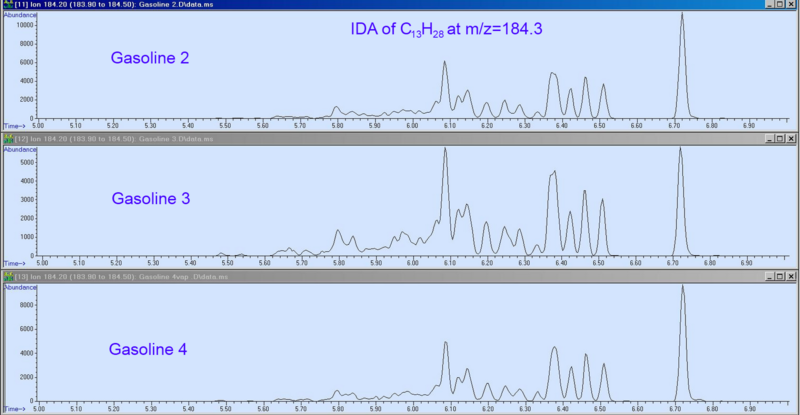 In Figure 2 below we demonstrate isomer distribution analysis (IDA) of the gasoline samples 2, 3 and 4 using m/z=184.4 of C13H28 as indicated in the figure. As clearly observed, gasoline 2 and 4 samples exhibit practically identical RSIM traces while gasoline 3 exhibits a different isomer distribution hence it belongs to a different fuel from a different source with much greater amount of branched hydrocarbons. This figure demonstrates that fuel vaporization practically does not affect the isomer distribution, particularly for late eluters hydrocarbons such as C13H28. Consequently, IDA brings another important tool for arson analysis that enables the correlation of the fuels to their source. Figure 2. Isomer distribution analysis of the three Gasoline fuels as above on the molecular ion of C13H28 m/z=184.3. Click on the Image to zoom. In many cases the arson accelerants used are heavier fuels such as Kerosene and or Diesel fuel which are harder to diagnose for their original source. Here again isomer distribution analyses can effectively serve to provide fuel fingerprint. In Figure 3 the analysis of a local diesel fuel is shown and compared with the analysis of highly vaporized kerosene that could be mistakenly considered as diesel fuel. Surprisingly we found that the diesel fuel also contained large concentration of oil (probably motor oil) that could be fully eluted with the high column flow rate of the 5975-SMB GC-MS with Cold EI. The two TIC mass chromatograms already provided valuable arson forensic information as the oil in the diesel fuel hints to the use of oil container that served to add to it diesel fuel. However, the main question was if the highly vaporized kerosene could be differentiated from the diesel fuel. Figure 3. Total ion chromatograms of a local diesel Fuel that was contaminated with oil (upper trace) and of a highly vaporized Kerosene (bottom trace). Click on the Image to zoom. 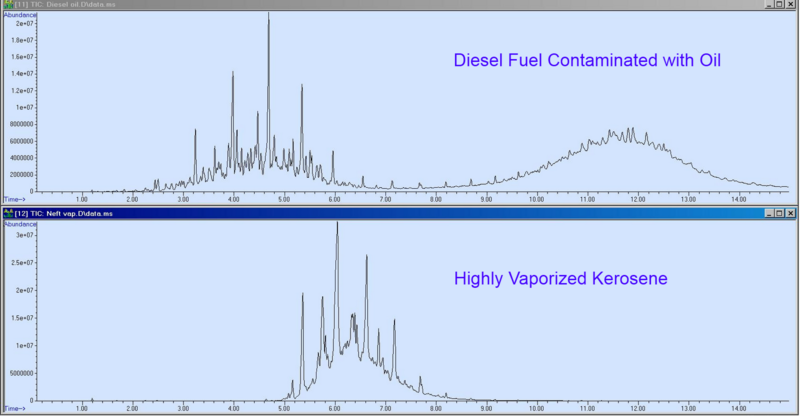 In Figure 4 below we show and compare isomer distribution analysis of the diesel fuel and vaporized kerosene samples of Figure 3. We performed the IDA via RSIM on the molecular ion of C18H38 m/z=254.3 which eluted at the high elution time side of the mass chromatograms to minimize potential small residual vaporization effect on the isomer distributions. As clearly demonstrated, the two IDA traces are very different hence we conclude that these fuels are from a different source and the vaporized kerosene sample does not relate to the diesel. Furthermore, these IDA traces can serve to find the local source of both of these fuels for improved arson analysis conclusions. We note that the big branched isomer peak that eluted near 6.85 min is probably of an isoprenoid hydrocarbon according to its Cold EI mass spectrum (side methyl every four carbon atoms). We found that these isoprenoid branched hydrocarbons are particularly abundant for C19H40 (pristane) and C20H42 (phytane) whose ratio relates to the origin and time of production of the original oil. The relative concentration of these isoprenoid branched hydrocarbons was found to be a sensitive composition parameter of fuels that serve well as their fingerprint. Figure 4. 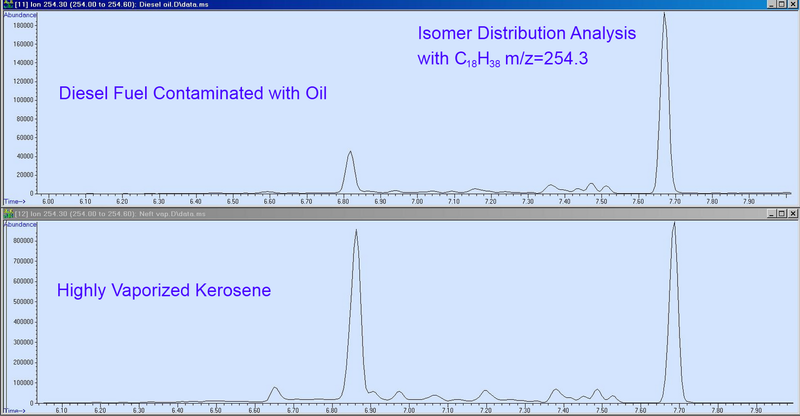 Isomer distribution analysis of the Diesel fuel and Kerosene of Figure 3 above on the molecular ion of C18H38 m/z=254.3. As clearly demonstrated these two fuels originated from a different geographic and/or processing source thus the vaporized Kerosene can not be mistaken for a Diesel fuel. Click on the Image to zoom. We demonstrated that isomer distribution (abundance) analysis can serve for fuel characterization and as its fingerprint for improved arson analysis with the Aviv Analytical 5975-SMB GC-MS with Cold EI. Isomer distribution analysis requires GC-MS with Cold EI and can not be properly performed with standard GC-MS in view if its pre-requisite of having molecular ions for branched hydrocarbon isomers. Enhanced molecular ions were found for all the fuel hydrocarbons, including amplified isomer mass spectral effects. Reasonable chromatographic separation was achieved among the various (many) isomers that was sufficient to provide clear fuel fingerprints. The whole IDA analysis took 15 min, about twice faster than usual GC-MS analysis via the use of higher column flow rates hence higher than usual temperature programming rate, yet this fast analysis time was sufficient to elute oil. We believe that isomer distribution analysis is a novel and powerful new tool that can significantly help in improving arson investigations via the provision of fuel fingerprints that can lead into the finding of its source. Currently IDA is not being used by the Israel police but we hope that it will be embraced by arson analysts and be widely used in the future.